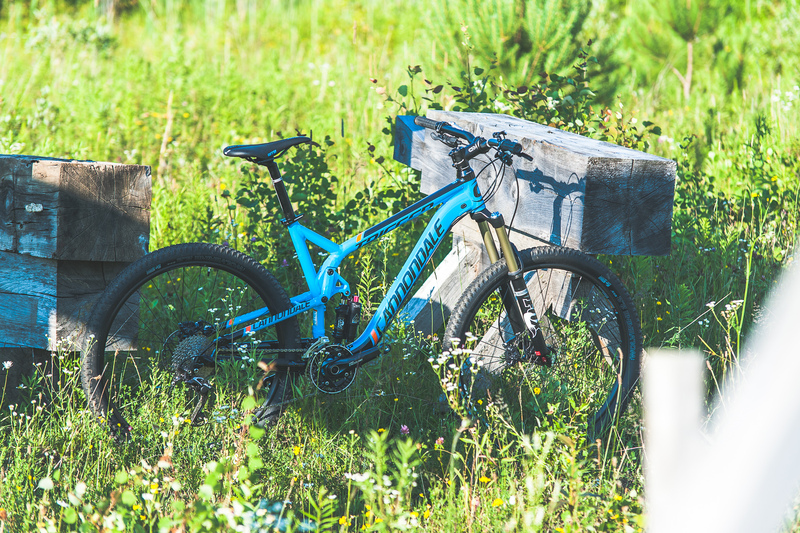 The Cannondale Trigger series is classified as “OverMountain”, which, in non-marketing speak, means that it is capable of basically taking you anywhere you want to go in performance and style. The Trigger 4 sits at the beginning of the lineup, providing a journeyman’s build of quality and reliable components, and most notably a trick rear shock co-developed with Fox that, with the flick of a switch, gives you a travel boost from a respectable 85mm on the trail to a hefty 140mm for the ride down. 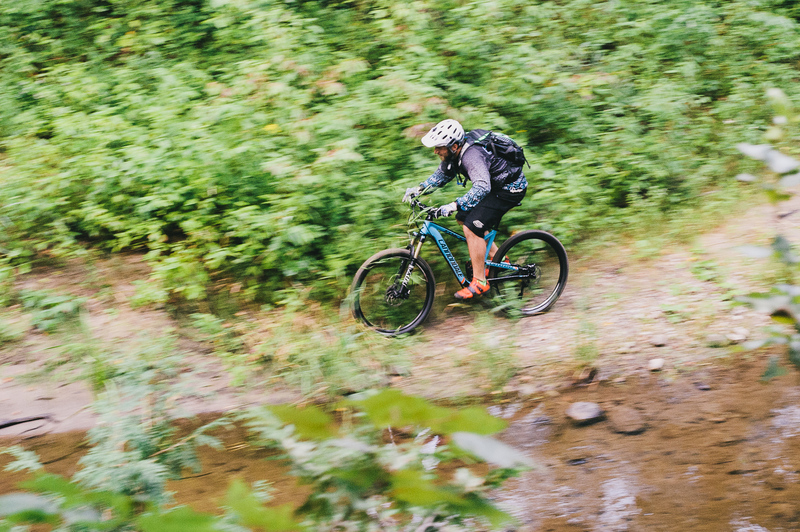 The Trigger sits squarely in our sights of finding the perfect “do-everything” bike that will unleash the cycling explorer in us all. 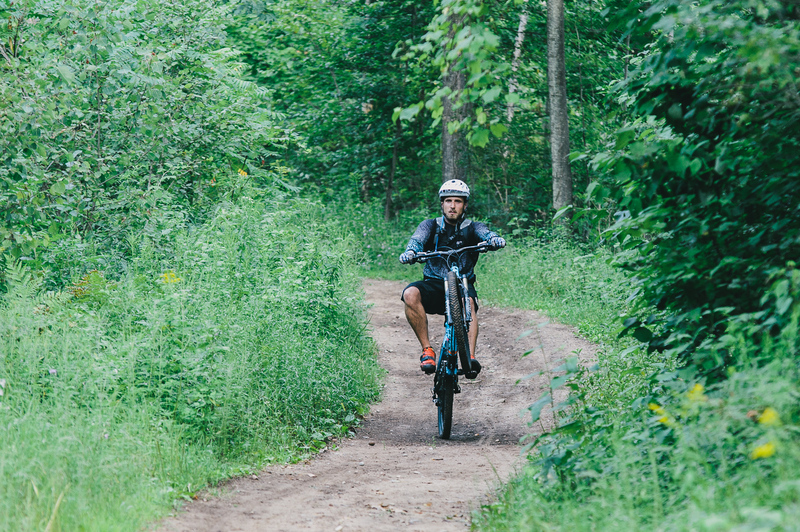 If you’re looking for a trail bike with a bit of a bite to help you get back down without giving up too much in the way of performance, you owe it to yourself to take a ride on the Trigger. The Trigger line starts at the “4” with a price tag of $3,140 USD, and skyrockets to a $10k + edition called the “Carbon Black Inc.”, which is basically a tricked-out stealth bomber; some of you may be familiar with its twin, the SR-71 Blackbird fighter jet. The Trigger is equipped with a few notable performance pieces. Its “quiver-killer” approach sees a rear shock, affectionately called the DYAD RT2 Dual Shock , that is essentially two shocks fused together, allowing for switchable modes between 85mm (Elevate) and 140mm (Flow) with a thumb-actuated lever on the handlebars (more on the shock later). 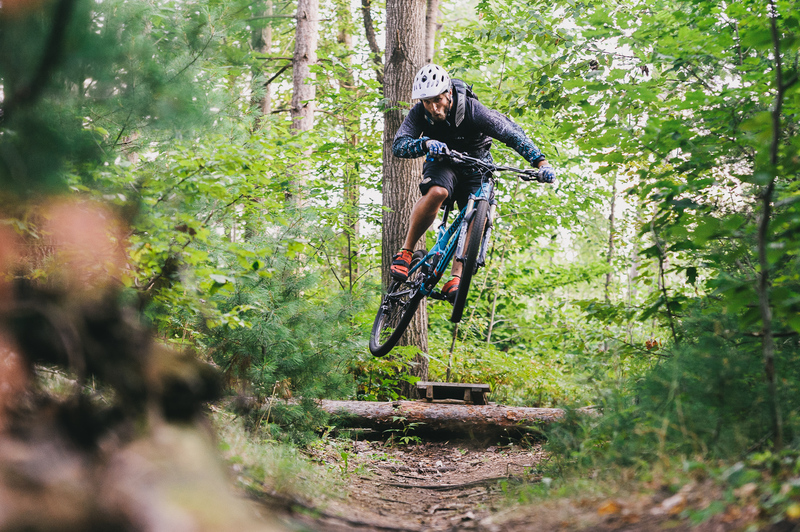 Equip this bike with a dropper seat-post, a dual-travel rear shock, selectable modes on the Fox Float fork, 650b wheels to handle any terrain and enough gears (30) to attack any kind of landscape imaginable, and you can start to see the goals of the Trigger lineup: to ride anything. Since the rear suspension designs have all pretty much been dialed to near perfection, manufacturers must now look to improving suspension technology (and work directly with their partners, as seen with this bike) and geometry-shifting capabilities to keep hunting for that perfect ride. The baby blue shines bright, and its price point is the most reasonably attainable without sacrificing quality and durability. 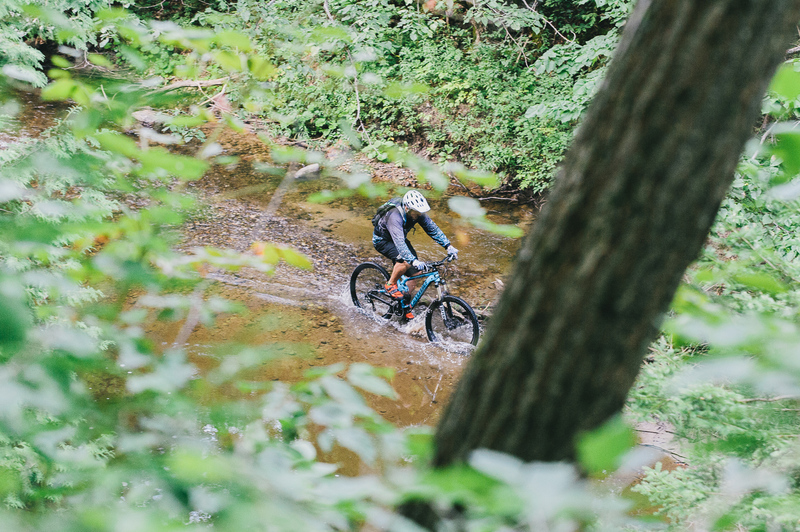 Decently equipped with a Fox Float 32 fork, Shimano SLX brakes and a mixed bag of Shimano drivetrain parts, Formula hubs and WTB tires, there’s not a whole lot to change right out of the box, which we are huge fans of. Just ride. The highlights of the package include Shimano SLX brakes (180mm rotors up front), the pinnacle of price-to-performance ratio and fantastic in power and feel. The Shadow SLX derailleur rounds out the kit with matching shifters. 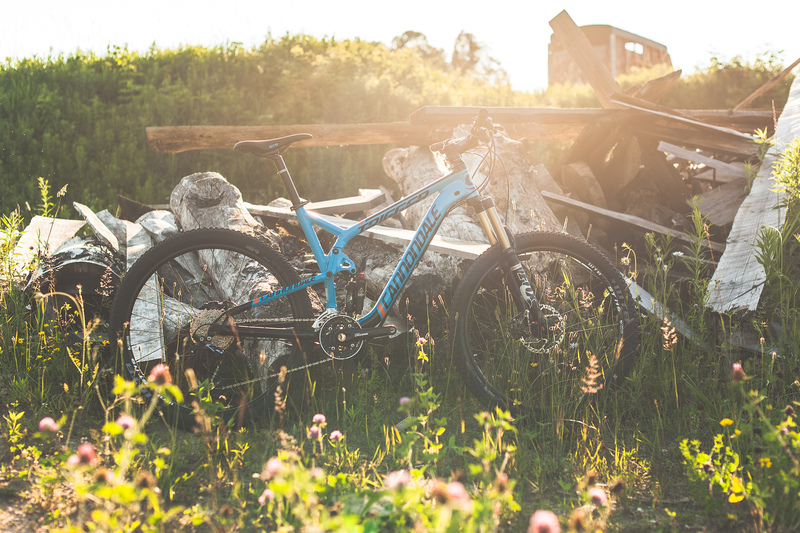 The Deore 3×10 drivetrain offers a ton of gear choices, hinting at its XC intentions. Up front, a Fox EVO Float 32 140mm handles impact duty with an air spring, rebound adjust and three travel modes of trail, climb and descent. 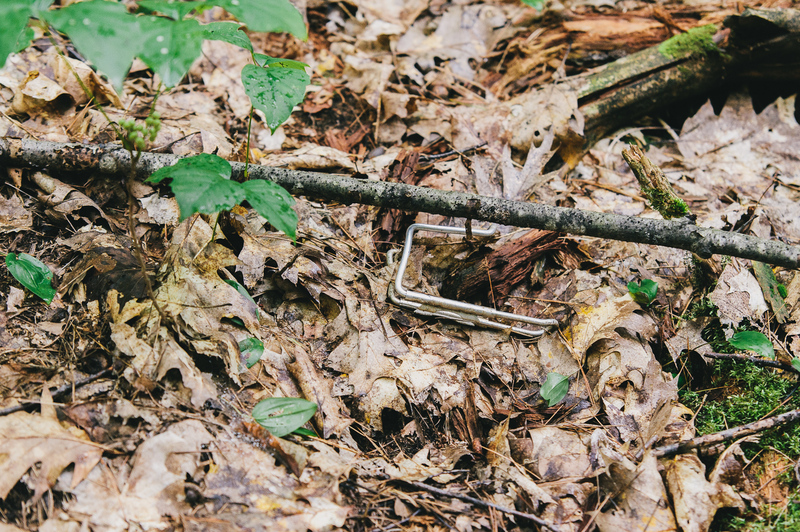 A solider in performance, the fork handles trail duty admirably but wanders a bit on the rough stuff; it’s tough to find a good fork at this price point, and we much prefer the 34mm size for a little more rigidity. The heart of the Trigger is the co-developed rear shock, the Fox DYAD RT2. 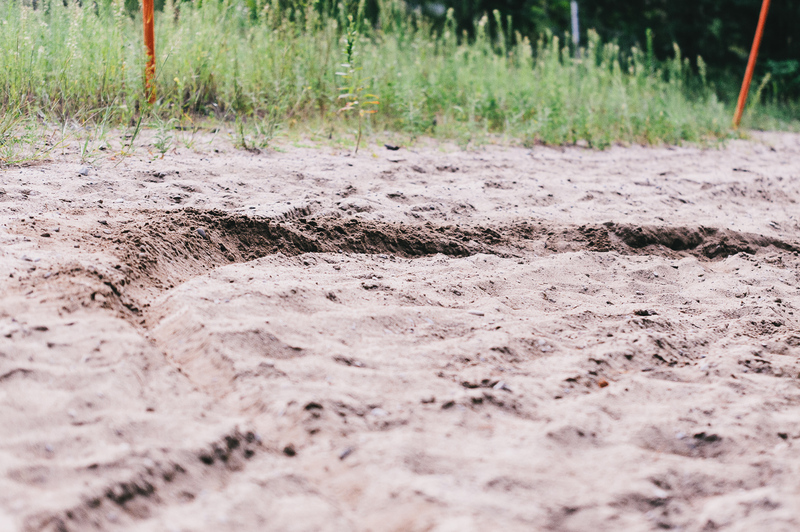 The shock allows the user to quickly and effortlessly change travel modes from 85mm when tracking on level ground, to 140mm when you need a little bit of a buffer between you and the dirt. It’s a dual-chamber air system with rebound adjust. Another feature of the travel changes is the “Attitude Adjust Geometry” that, when in 140mm, drops the bottom bracket and changes the head and seat angles to allow for easier descent. 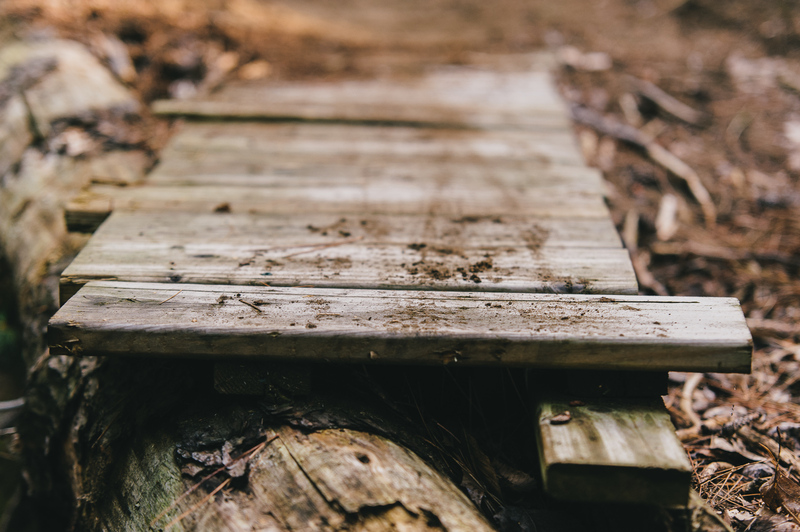 Flip the switch to return to trail settings and gain back some geometry. Through-axles on either end with WTB tubeless-ready 650b (27.5″) wrapped in WTB Wolverine tires round out the package. A solid offering with just a couple of in-house parts (seatpost bars and stem, but who cares) complete the Trigger 4; all in all a very competitive package in a Swiss Army knife-type intent. The capabilities of the Trigger and its 68.0 degree head angle lie squarely in the type of riding you do and where you do it. As we age, the idea of adding fitness climbs and grinding out difficult sections going up somehow doesn’t seem so bad; it keeps our heart and lungs in shape and makes the sweet reward of descent that much more tasty. 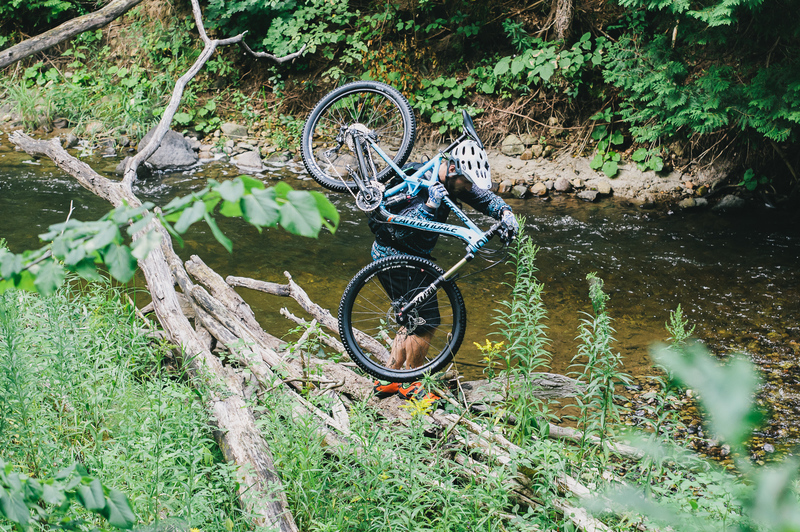 Having a bike capable of doing both is an attractive proposition. 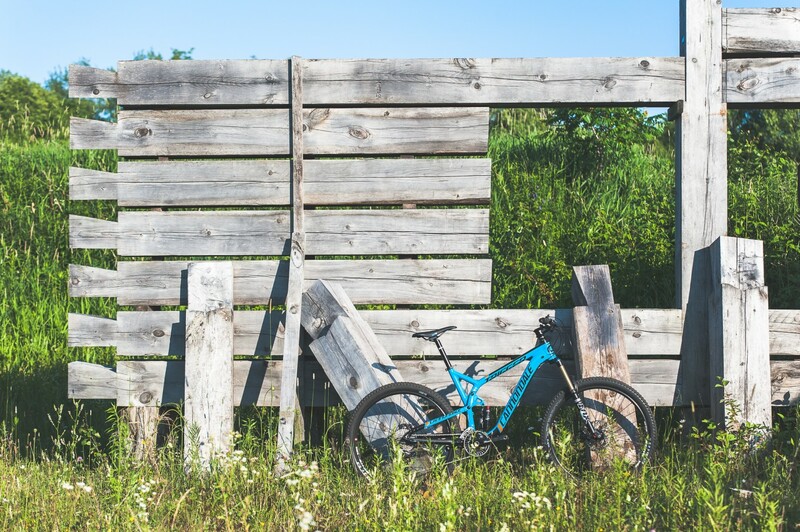 Ridden mostly in the hardwood forests of Ontario, Canada, the Trigger shines in the 140mm sweet spot of just enough but not too much travel and geometry. Perfectly fine boosting off little trail features and smashing through the odd rock garden and root trap, the Trigger is steady-as-she-goes, not putting up too much of a fight through the tough stuff. 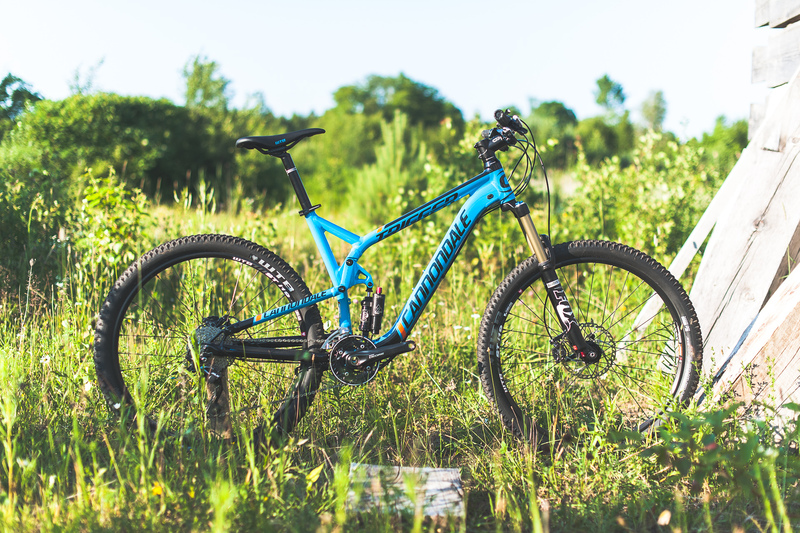 The Fox fork just holds on in keeping up with the rest of the bike, the rear suspension is where the bike shines, and the DYAD RT2 shock with its dual personality is the backbone to the ride. 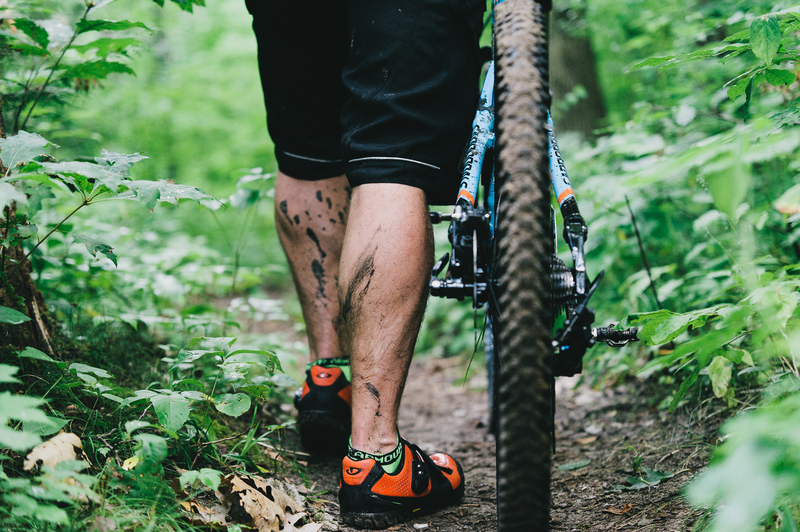 For all the innovation, technical-first approach and adding dials, switches, knobs and rebounds to tailor to specific riding conditions and comfort levels, we can’t help but wonder where the next step in mountain biking performance will take us. It’s only a matter of time before “smart” suspension pieces monitor and control dampening through on-board circuit boards that change settings based on the input it receives. The DYAD RT2 suspension is an analog version of this, offering a hard switch between riding conditions that the user can change on the fly. Innovation is great, especially in an industry pumping out an already incredibly high-quality product, but fair warning to the rider: if you enjoy setting up your bike properly and having a wide range of adjustment in both front and rear and have the patience to feel the satisfaction of riding a properly dialed machine, this is the trail bike for you, especially when equipped with a lefty fork. If you’re the type of rider to shy away from the technical side and prefer a one-and-done setup, this may not be the bike for you. Choice and options are fantastic, should you choose to use them. 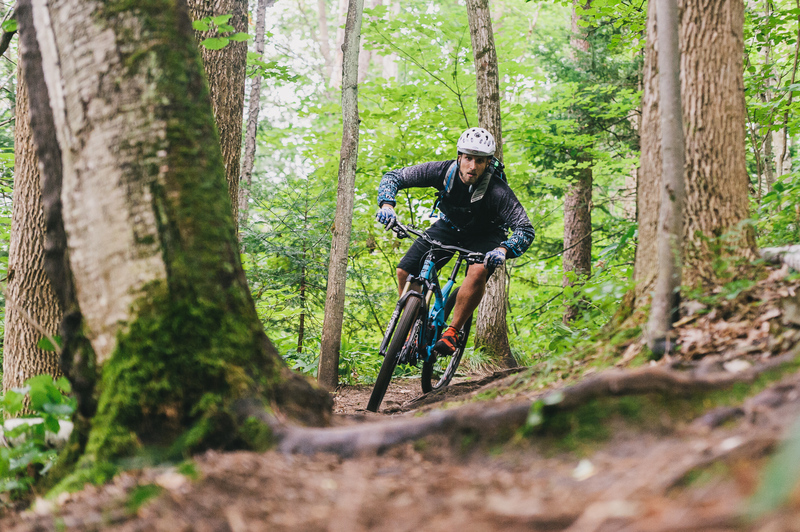 If you’re the type of rider who travels to the green mountains of Vermont in the summer and likes to hit varied terrain throughout the riding season, having the option to dial in your ride to suit the conditions is a huge positive. The Trigger 4 is a bit of a slow climber; the front fork equipped with a lock-out but no travel adjust means you’re pointing up with the full 140mm exposed, which causes the front end to lighten up when you need it to be planted. This is especially evident if the bike is left in “Flow” mode and climbing feels like you’re sliding off the back of the bike. We wouldn’t trust the 2.2 WTB Wolverines with our first-born… never instilling great confidence, we just couldn’t warm up to them. The Trigger series is unique enough to get a good, hard look for the “quiver killer” style of bike it sets out to be. It’s packed full of technology and enough adjustment knobs and setting options to satisfy any rider regardless of how picky they are. Set it up so you only need to flick the DYAD lever and it will return complete enjoyment. Or set it up to ride in Flow mode and never have to worry about needing more travel—or question why anyone would need less. Spend hours pouring over user manuals and test-riding until you keep a cheat sheet of knob turns in your riding pack. The path to enlightenment is yours for the choosing, as the end result will always be the same: a damn good time. 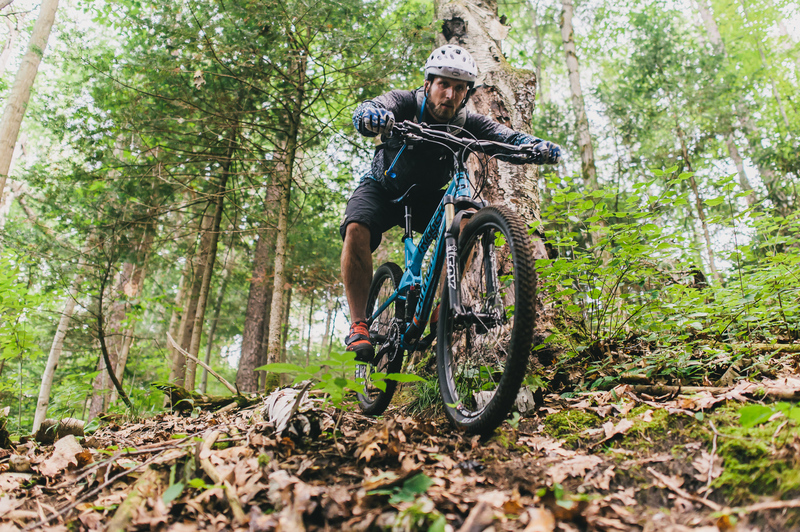 For more info about the Trigger and Cannondale head on over to Cannondale.com or to your local Cannondale dealer. Stefan is the Editor and in-house photographer at Adventure Seekers. With a background in social media, content development, photography and writing, Adventure Seekers is truly a place to call home. With a penchant for learning and also exploring what the world has to offer, he's always looking for the next project to share with the world.